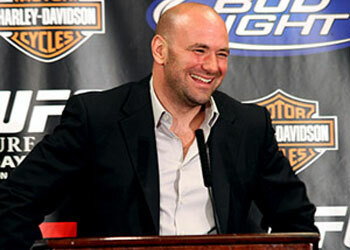 Dana White is in hot water after his latest YouTube blog hit the internet on Thursday. During the video clip, White went off on Sherdog.com writer Loretta Hunt and her “anonymous” source regarding the UFC’s “new” credential process for managers/agents. Two days ago, Hunt authored an article stating that the UFC was moving forward with plans to limit backstage access during their events in an attempt to control locker room traffic. The organization felt that there were far too many clinger-ons crowding and confusing their employees. However, Hunt’s anonymous source stated that White was the one that implemented the changes, proclaiming that it was his attempt at wedging himself between the fighters and their representatives. White, never one to back away from a good verbal spat, went on a three-minute tirade that found Hunt, her reporting skills, and her unnamed source caught in the middle of his cross-hairs. Soapbox speeches like this from White aren’t exactly out of the ordinary, however the brash president decided to use even more colorful language than he normally does, prompting representatives from GLAAD (Gay & Lesbian Alliance Against Defamation) to demand an apology. “Whoever gave you that quote is a p***y, and a f***ing fa**ot and a f***ing liar,” White emphatically stated. “I chose some words that offended and hurt some people,” he said. “Anybody who knows me knows that I would never, ever maliciously attack somebody who wasn’t attacking me, and as far as the gay and lesbian community, my comments were not directed towards them. Who really knows if White’s apology is enough to make this issue go away. Fact of the matter is, this doesn’t really hurt the UFC all that much. Realistically, their key demographic, truth be told, uses this sort of language on a daily basis. If anything, this story has provided the organization and White greater national exposure. Any controversy is good controversy, especially in this case.